There are many methods to pressurize the barrier fluid for a dual pressurized mechanical seal. Each method, or piping plan, uses a different mechanism to apply the pressure to the barrier fluid and, as a result, each has its own set of advantages. One of these methods is American Petroleum Institute (API) Plan 53C. Although not as widely installed as a traditional API Plan 53A system, it does differentiate itself from other methods. API Plan 53C has the ability to change the barrier pressure as the pressure inside the pump changes. This pressure tracking ability makes this system ideally suited to high-pressure pumps, or for pumps that tend to experience a wide range of operating pressures. Barrier fluid circulating loop: A pumping device within the mechanical seal circulates barrier fluid to a heat exchanger, where heat absorbed into the barrier fluid is dissipated and then the fluid is returned to the mechanical seal. Piston accumulator: Stores barrier fluid and amplifies pressure from the pump to pressurize the barrier fluid circulating loop. The piston accumulator pressurizes the barrier fluid loop by using a reference pressure line connected to the pump. This reference line is used to pressurize one side of the piston, which pushes the piston against the barrier fluid located on the other side. As the piston rod reduces the effective area of the piston face in contact with the barrier fluid, the barrier fluid pressure is amplified. The pressure amplification ratio is simply the ratio of the area of each side of the piston. Increasing the piston rod diameter has the effect of reducing Area 2, and thus increases the pressure amplification ratio. Due to the practicalities of design and function, amplification ratios are typically in the range of 1.05 to 1.30. 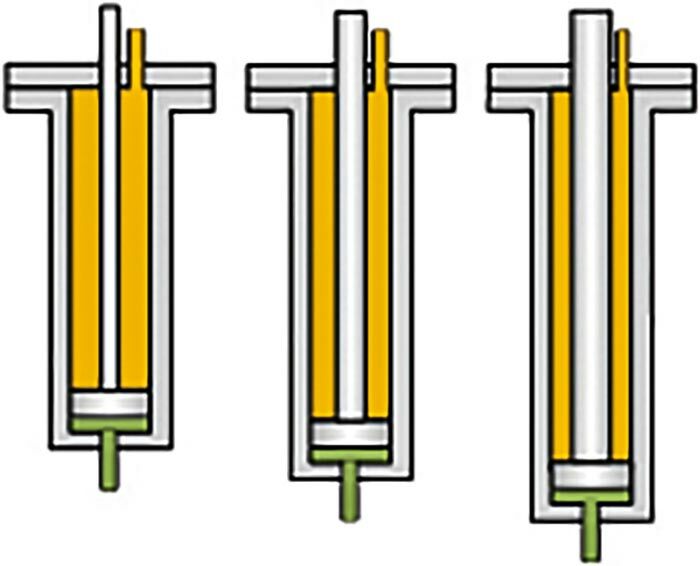 Pressure ratios above this have large diameter piston rods (relative to the cylinder) and become longer in order to provide sufficient barrier fluid storage volume. As the pressure changes in the reference line, the pressure produced by the piston accumulator and delivered to the barrier fluid circulating loop will change proportionally to the amplification ratio. The ability to track barrier pressure with respect to the reference pressure is what makes an API Plan 53C different from other dual seal barrier systems. Since the barrier pressure is generated by amplifying the reference pressure from the pump, the piston accumulator requires no external utilities to function, which further simplifies the installation and operation of a Plan 53C system. Selecting the right amplification ratio and reference pressure point on the pump pressure casing is key to ensuring the correct barrier pressure for the mechanical seal. API 682 recommends a minimum barrier pressure of 1.4 bar/20 pounds per square inch (psi) above the seal chamber. The reference pressure and the amplification ratio need to be selected to meet this minimum requirement. Additionally, the range of pressure at the reference point must also be factored into the selection process. For high pressure pumps, the seal chamber can be used as a reference pressure and meet the minimum differential pressure requirements. A simple connection in the seal chamber or mechanical seal gland plate can be used to plumb a reference line to the piston accumulator. However, for low pressure pumps, a pressure higher than the seal chamber must be maintained in order to meet the minimum differential pressure requirements. Depending on the pump design, this can be the pump’s final discharge pressure or the discharge of an intermediate stage (if the pump is a multistage design). An alternative design would be a piston accumulator with a “helper spring” that provides a minimum pressure offset. The two elements of the Plan 53C system, the barrier fluid circulating loop (with heat exchanger) as well as the piston accumulator, need to address different factors. The barrier fluid circulating loop needs to be installed to offer the least resistance to barrier fluid flow produced by the pumping ring located within the mechanical seal. The location of the heat exchanger and the path of the interconnecting tubing between the heat exchanger and mechanical seal are critical to meeting this requirement. Additionally, provisions to vent the circulating loop must be incorporated so any trapped air can be removed from the system prior to commissioning. A low point drain is also recommended when operators are decommissioning the system for maintenance. The location of the piston accumulator is more flexible. The only flow that occurs in the piston accumulator is the slow movement of barrier fluid to replace any leakage that occurs from the mechanical seal.